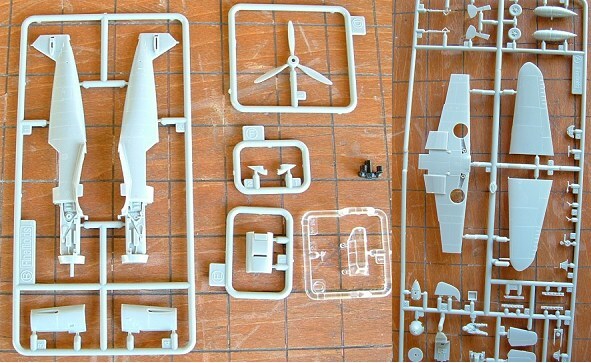 The small Japanese manufacturer Fine Molds has released a new kitting of the Messerschmitt F-2. 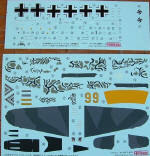 They also have available kit FL-2 for a Bf 109 F-4. A nice glossy box top illustration with a profile on the sides for the two decal options greets the buyer. The main parts tree is enclosed in a clear envelope with the fuselage halves moulded separately. The minor model difference parts, chin cowling, prop, intake are on small trees packaged together. The transparent parts are enclosed with the decals. 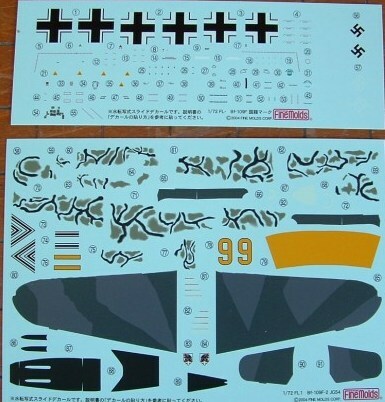 The extraordinary element of the decals is the inclusion of a complete camouflage scheme for two aircraft of II/JG54 Oberleutenant Hans Philipp and Hauptmann Deitrich Hrabak, Russia 1941. That’s right, just paint the model RLM76 Helleblau, then place the finely printed camouflage over that. 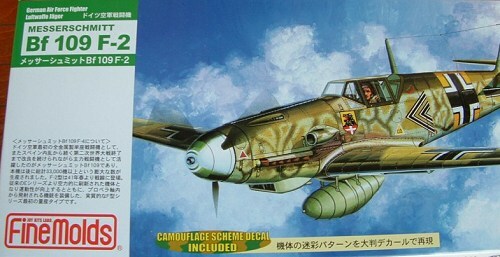 Fine Molds have previously provided this type of camouflage in their Kawasaki Ki-61 II kit for plausible ‘snake-weave’ and ‘splotch’ schemes. Very cool, but I’ll be watching for these to turn up on the tables for judgment. Practitioners had better get their decals perfect! Adequate cockpit detail is provided as moulding on the fuselage insides, cockpit floor/back/rear panel to which will be added a firewall, instrument panel and seat base. There is a cushion/parachute pack and a very nicely moulded pilot figure to fill the space under the canopy with it’s head armour panel. The upper wing surfaces have the slats moulded closed, wheel well roof and radiator matrix detail defined on the inside. Elevator and tailplane surfaces are well moulded. The fuselage halves have a basic representation of the DB601 engine and bearers which could be either augmented of replaced. Engine covers have no inner detail. A pair of cowl guns are very nicely represented, but generally will not be visible. There is only a temperate supercharger intake, tropical filter not provided. The only option available to the builder is whether or not to drill out mounting holes for the centre-line rack and to add or omit the tank. The pointed style propeller is on a separate tree, and backing plate with a well shaped spinner on the main parts tree. The undercarriage wheels and tail strut are good representations of the real thing. Fine aileron dynamic balances, pitot and aerials round out the parts count. Instructions are well drawn isometric diagrams, but have only some headings and colour notes in English. The body text being entirely Japanese. No matter to me, but some may have issues with this. I purchased this kit for a particular project and am looking forward to discovering if it builds as well as it looks in the box.